If you’re like me, you probably enjoy looking at homes online. Many people browse homes on the internet for fun. My wife and I like to look online at homes for sale in Colorado Springs, deep in the quiet mountain areas where we could never live, with our current lifestyle. We like to daydream about what it would be like to wake up and sit outside with our coffee in the morning and enjoy the deafening silence of mountain seclusion. It’s fun to daydream. But in reality, when you are seriously looking to buy a home, it can be frustrating when the images online are the only visual aid to help you determine whether or not a property is worth looking at. As a home seller, online property photos are one of your strongest assets for getting showings and eventually selling your home quickly, and for top dollar. With photos being such a huge part of your home selling marketing leverage, it makes sense to have an extensive list of questions to ask the person taking the photos of your house when you’re ready to sell. I have been in the business for many years and have seen the good, the bad, and the ugly when it comes to real estate photos. Through the years I have learned some major tricks of the trade, which I will share with you. Here are some good technical questions to ask your real estate photographer when listing your house for sale. These questions will help ensure that you get the best real estate photos possible. What size wide angle lens do they use? A wide angle lens captures more space and makes the room look as large as it possibly can. Most stock DSL cameras come with an 18mm wide angle zoom lens. In my experience, many real estate photographers are perfectly content with an 18mm lens, but in reality, this is not sufficient to capture the whole room, especially in smaller areas. The best size wide angle is normally a 10mm lens. An 8 mm lens will create a “fish eye” effect which distorts the image and makes it less appealing to online home buyers, while 10mm is where that threshold stops. A good professional real estate photographer will usually have an upgraded wide angle lens to capture the most amount of space possible. Some 10mm wide angle lenses will create a slight “fish eye” effect, but image correction software, such as Adobe Lightroom, will correct and manipulate the image back to shape without losing the edges of the image. Knowing whether your photographer uses a wide angle lens is probably the single most important piece of information that you can find out about them. As you can see in the comparison image, the depth of the room is dramatically different with a 10mm lens as compared to a normal 18mm lens. 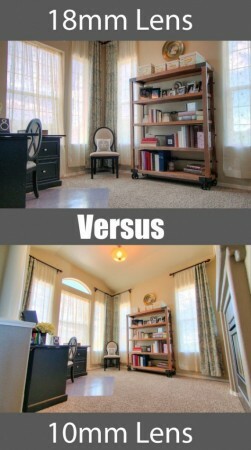 In bedrooms and small areas, this difference can make or break an online home buyers desire to view your listing. Make sure to find out what kind of lens your real state photographer uses and don’t let them show up with a stock 18mm zoom lens. Do they use HDR photography software? HDR (High Dynamic Range) imaging is a process that involves taking 3 or more photos of the same image, while using different light exposures. Auto Exposure Bracketing (AEB) is a feature found on most DSLR cameras. It will automatically snap multiple images while changing the light sensitivity on each one. One image will be dark, one will be average, and one will be very light. By adjusting the ISO and/or aperture of each image, the three images gather light from different areas of the room which could never be captured in one single shot. HDR software will then take the three images and overlay them to grab the best parts of each one and create one final processed image. This allows the photograph to have equal amounts of light gathered from all areas of the room. Typically a single image without HDR will have darker and lighter areas because the depth of field, and a single shot cannot fully capture all the areas of a room in one shutter click. With HDR you can really make a room light up and cause the viewer to feel as though they are standing in the room as they look at it. It’s one of the greatest photography tricks for real estate, and should be an essential part of your real estate photographers skill set. It should be noted that simply having the software to process HDR images is not enough to make a photographer’s images flawless. It’s easy to over process an image and make it look like a computer generated image. Have you ever looked at homes online and noticed pictures that looked like virtual reality? That’s HDR over-processing. A good real estate photographer will know how to use HDR to gather the best light features of each photo, without making it obvious that they are using software to manipulate it. Each photographer will have their own artistic touch that they add to their work. 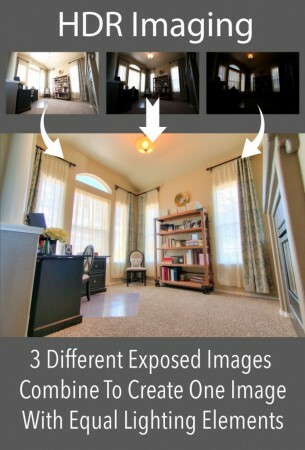 It’s important to know that your real estate photographer is aware of the unnatural affects of HDR over processing. As with most artistic processes, moderation is the key. Using HDR in moderation to gently bring out the best light features of the room has a powerful effect on home buyers as they compare your listing with other real estate listings online. A good real estate photographer will make your listing stand out above the rest. HDR imaging requires a tripod to get the best images, since it’s gathering 3 different images in a frame burst. Any slight movement of the camera will cause the photo to be blurry when processed. If your real estate photographer shows up without a tripod, it should be a red flag that you are not getting the best quality images possible. Tripods are a necessity for good lighting. Make sure your real estate photograph knows how to use HDR imaging and uses a tripod with a decent wide-angle lens. What model camera do they use? This is a very important questions. Since cameras are all digital now, new current models out perform old models by a long shot. The shutter speeds and image quality of today’s cameras are incredible. If your photographer is using a camera they bought in 2001, it’s highly likely that they are getting less quality images than a comparable new DSLR Camera. One of the main aspects to new camera technology is the frames per second. Here is a great list that shows the FPS of each popular camera on the market: http://www.hdr-photography.com/aeb.html. You’ll notice that Nikon and Canon seem to have the most powerful cameras on the market, which is why you generally see these cameras everywhere. Take the model number of the camera your photographer uses and cross reference it with this list. This will give you a good idea of the quality of the equipment that they use. I personally wouldn’t want my photographer to use a camera that has any less than 6 fps. The images above were taken with a Canon 70D, which is a great camera for real estate photography. Do they use a flash? To a photographer that has been around for a while, using a flash has a bit a nostalgia. Old cameras did not have the ability to capture light at the speed of modern cameras, therefore using a flash was the best way to enhance the lighting in an image. The problem with using a standard flash for real estate photography is that it creates shadows in the image and takes away ambient lighting features. If someone uses a flash for real estate photography, they are most likely not using HDR imaging, and are not as knowledgeable of new camera technology and the best ways to capture natural light. If your real estate photographer shows up with a flash, it should be a red flag that you are not going to get the best possible pictures for your real estate listing. Unfortunately, there are many real estate agents who do not want to pay the expense of hiring a professional photographer, or learn how to take professional photos themselves. They show up with an average camera and a clunky flash, (or worse yet- use their phone) and start shooting away. As a full-time REALTOR, I look at thousands of real estate photos every year. When I take photos for my own listings, I generally snap around 500 images and then narrow them down to the top 20 to 30 photos. If you hire a real estate agent who does not respect or understand the complexities of professional photography, it may have a great impact on your ability to attract the most amount of buyers to your listing. Make sure that you ask the questions mentioned in this article to avoid getting stuck with some bad real estate listing photos. There are so many bad real estate photos out there that people have created websites fully devoted to mocking and displaying them. Are you in good hands with your real estate photographer? There are many common questions that you can ask a photographer, such as “how long have you been a photographer?” and “ how often are you hired to take photos for people?”, but in my experience, the 4 questions listed above will cut straight to the heart of the interview and will quickly let you know whether you are dealing with a pro, or a novice. If you are dealing with a novice, stand your ground and ask for a better photographer. The images that you and your REALTOR put online are extremely valuable. Photography is one of the most important aspects of real estate marketing. You do not want to be one of the many sellers who have poor images which turn buyers away. Photography is a vital part of good real estate marketing. You want to have images that make buyers emotionally attach to your house before they ever set foot inside it. They should have a good wide angle lens, preferably a 10mm. They should have a tripod. They should have a newer model camera. They should not use a flash. 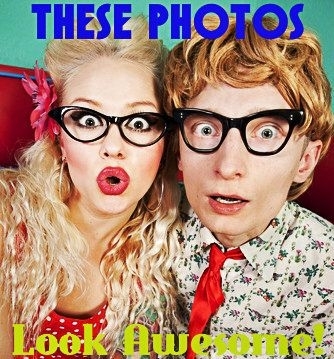 For a humorous look at how much influence online real estate photos have on the real estate business, take a look at my article called Looking at Homes Online Versus In Person. The info-graphic in the article will give you a good idea of what buyers deal with when shopping for a home online. It can be very frustrating for a buyer to look at a home in person, only to realize that it is very different from the way it was marketed online. If you plan on selling your house, do your own due diligence and interview the photographer with these questions. If you are not comfortable interviewing them, then ask your REALTOR to do it. If your REALTOR is your photographer, you definitely want to ask them these questions, because most REALTORS are not professional photographers. Simply having a high end camera does not equate them with being a professional. Photography is a challenging industry that is always evolving. Having the person responsible for your valuable real estate photos be on top of their game can really swing the odds in your favor when listing your house for sale. The image above of the upside down house is one I saw just yesterday while looking at homes for a client in Colorado Springs. Yes, this really just happened. Don’t assume that your listing will look great. These kinds of mistakes are common and I hope that it never happens to you. I wish you the best of luck with your online real estate photos. With the information that you have learned from this article, you should do great! How to get the best photos when selling your home was written by Andrew Fortune. Andrew is a Real Estate agent in the Colorado Springs area and enjoys collaborating with other real estate bloggers and social media experts to help inform consumers of the important details involved in today’s real estate market. His website, GreatColoradoHomes.com is a great resource for home buyers and sellers in the Colorado Springs area. Next post What Makes a Real Estate Agent Military Friendly? Bill, great info in this article. I agree with you that in today’s world excellent photos are key to getting showings and a sold sign in the yard! In addition to your points, i think one of THE most important criteria for good home photos is the photographer’a ability to COMPOSE the photo. Many photos are technically correct but have poor composition, cutting off roof tops, or half the house,or showing a view of a room that has no real appeal. There should be as much “wow” factor as possible in each photo, and good composition will make any photo more appealing than one which is out of balance or poorly framed. The room shot you use in your technique comparisons is not too well composed in my view. I can’t see out the windows and the room doesn’t look very comfortable from this POV. Asking a photographer to see their portfolio is one good way to judge if they have the ability to Compose the photo. Great article with lots of good information! Thanks Maryann and Marty. I thought Andrew did a phenomenal job explaining why real estate photography is so important to sales. I’m sorry, but the photographer that shows up with a flash (and knows how to use it) is going to give you a much better image than one who simply relies on HDR. Your flash example above, shows somebody using on-camera flash pointing straight into the room (typical of Realtors) because the shadows give it away. HDR images usually have muddy colors (not clean & crisp like you would get with bounced flash). Yeah, someone who strictly uses HDR can be in and out faster than someone who uses off-camera flash, but they will more than make up that time sitting in front of the computer fixing the typical myriad issues of HDR. Whereas, the pro that knows how to use supplemental lighting (i.e. not blowing everything out), will spend longer on-site, but significantly less time in front of the computer. Very few know how to do HDR correctly to end up with a natural looking image. P.S., Bill, you might want to correct your verticals, walls in real life don’t slant inward at the top. Tim – I did not write the article. It was a written by Andrew Fortune. Sorry Bill, I stand corrected on the author. I agree with Tim–HDR brings to the table a whole new set of problems (including flat lighting, poor contrast, etc). As a professional real estate photographer, I use multiple off-camera flash and the vast majority of the images I provide to realtors are single exposure. I agree that bringing just ONE flash and expecting to get high-quality results is not feasible, but a photographer that really knows how to shoot interiors and wants to use flash will bring 4-8 flashes to use at their disposal. I’m assuming the 10mm lens would be for a crop-sensor camera? There is no way a 10mm should be used on a full-frame camera for interiors. While I applaud Andrew Fortune’s explanation of the value of high quality photography for marketing listings, the technical information he provides is either misleading or incorrect. I am a commercial photographer and do a fair amount of real estate marketing photography, with a portfolio that, I believe, reflects a high degree of quality and professional experience, so I think it is fair to say that I am expert in these matters. I rarely use HDR techniques, make extensive use of flashes for supplementary lighting and only occasionally use lenses with as extreme a wide angle as Mr. Fortune advises. I will not get into a lengthy explanation in this forum of why I use the techniques and equipment that I do or why I think Mr. Fortune is wrong. I hope that my work speaks for itself (www.eichlerphoto.com) and will serve as a rebuttal to his assertions. However, I would like to say that, in my opinion, those who are seeking high quality professional photography to market homes should look at a photographer’s portfolio and professional experience, making their determination from that alone. In the end, all that matters is whether the photographer can consistently deliver the required results. Frames per second (fps) has no bearing on the quality of the photos or the quality of photos created by the camera. If this was sports photography then it could be a factor in the ability to be able to capture a crucial moment in time. HDR is the best way and flashes are bad? Say what? Most professional real estate photographers are going away from the HDR process of the past and moving into using multiple off-camera flashes to properly light a room. Oh, and 10mm is way too wide an angle to use! 17-24mm is much better. And I’ve been shooting real estate for 10 years. Hi Larry. I agree that fps is not a critical factor in the quality of a real estate photo, but it is a good indication of the camera’s overall age and ability. New camera’s have a higher fps, which helps a non-photo techy home owner have a reference to the quality of the equipment being used to shoot their photos. David, I understand your position on using flash properly. In my experience hiring photographers for property photos, the photographers who use HDR over flash have always had the better images and are usually much busier. It’s great that you have a personal preference to use an external flash(es). Your images look great and stand out in comparison to most photographers. This article covers GENERAL real estate photography and does not define the whole industry. In most cases in my area, if a photographer shows up with a flash and has no idea what HDR is, then they are probably not going to produce quality images. As far as the wide angle lens, I’ve never had anyone dispute that. In residential photography, it’s nearly impossible to get a photo a room that is 10′ x 8′ with a standard lens. Homeowners love to see the photos of their home with the wide angle lens because it makes it look much larger. Mike, the camera used in the images above is a Canon 70D with an APS-C sensor, so yes it uses and advanced crop sensor. Tim, to use the statement “simply rely on HDR” is misleading. HDR is very complicated and requires the photographer to take many more photos tham usual and then process each shot based on the natural lighting of the room. The photographer that showed me how to use this software spends more time on the image processing than at the actual shoot because she is meticulous about the final product. She is also the busiest photographer that I know. One could also say “simply using a flash”, to down play the flash method. In reality, both methods are extremely difficult to do well if used properly. In my experience as a real estate professional, the photographers who use a flash on residential real estate photography typically have outdated images in my area. In real estate, there are always going to be debates on technology preferences, especially as waves of new technology become available. If you prefer a flash over HDR, then use a flash and make your point well. Just know that there are many other real estate photographers out there doing a poor job with a flash and making it harder for you to justify your point. Just as I have to make my case that I am not the typical Realtor and have to address people’s past bad real estate experiences, so will you have to do the same thing in the residential real estate photography business because the photographers using HDR and Lightroom are the ones getting all the business in my market. Interesting article. I am a professional photographer from MN and agree with those who say the best photos use off camera flash. I usually carry 5 flashes, but typically use 1 to 3 in a shot. Also, the photo examples with the 10mm lens are good as examples , but poor for architectural examples since the camera is not level. This creates converging vertical lines — a big no no in real estate shooting. Anyway, great discussions. I am taken back by this article when I read “If your real estate photographer shows up with a flash, it should be a red flag that you are not going to get the best possible pictures for your real estate listing”. I think this should state “if your real estate photographer show up with one (1) on-camera flash…..”. Flash is NOT nostalgia – I think it will be around for a long time to come. Perfecting how to use it, with multiple flashes, and OFF CAMERA is what a professional interior photographer does. I have spent many hours on perfecting multiple flash techniques. I am a reader of the strobist blogs, and I follow Scott Hargis’s techniques (he has the best book that I bought hard copy and read it over and over – all on interior lighting). I believe that anyone showing up and just using HDR for the photos, know nothing about flash photography, and are counting on their software to do the job for them – and that should be a red flag!!! I think Flash vrs HDR is a preference NOT a skill check – unless both are not done correctly. 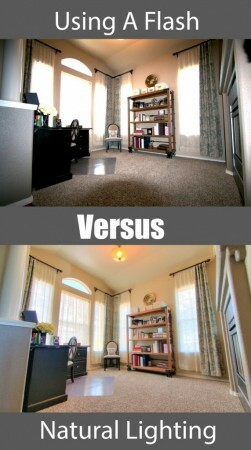 BTW a wide angle lens look best (the sweet spot that is) at 20mm-24 for interior photography. A 10 mm will give you converging vertical lines YUCK!! Any realtors reading this article should disregard most of it. The comments about FPS, flash, ultra wide angle and HDR are nonsense. To get the best photographer just take a look at their website. If their photography style looks good to you then hire them. What an AWFUL article. Not only is there so much wrong with this advise, it’s so far from the truth of what actually make great real estate images and how they are shot. Ask what camera? Who cares, as to see the the final images. Do they look WOW and great? If so….the camera is totally irrelevant to the realtor. Please, IGNORE EVERYTHING written and as to see the photographers final product and judge from there!!! Andrew, I have based my whole business on my expertise of lighting interiors. Which in my case involves off camera flashes. From my experience HDR photography looks flat, muddled and unrealistic. Yes, it takes a lot of effort to learn interior photography with flashes. But it is worth it. If you want crisp colors and nicely exposed windows. It takes longer to do a home using these techniques, but it is totally worth it. I had no idea that there is such a negative mentality towards HDR photography. I’m very surprised. My suspicion is that many of these comment are based on photography in general, and are not necessarily real estate photography. I asked my photographer how I should respond to these comments and she said that I should have never mentioned the issues with flash because it’s a touchy subject among the photographer community and many photographers just don’t want to mess with the technology. She also said that she only uses HDR on real estate photos and would never use it on wedding photos or family images. It’s specifically good for real estate photography. I am surprised that no HDR photographers have chimed in on the discussion. The best real estate photographers that I know all use HDR and take the best photos in my local market. As a Realtor, I noticed an immediate difference in my client’s response to their property photos when I used a photographer who uses HDR. For that reason alone, I am sold on it. My clients love it, and ultimately they are the ones paying for it. Since I don’t have a niche market selling homes to photographers, most of my clients are regular people who see the actual image alone and could care less about all the technical points. They don’t look at photos as a photographer. Either do home buyers. They are not looking for images that would be on the front of National Geographic. They are looking for images that make their home look as big, as light, and as appealing as possible. This is an article about real estate photography from an experienced real estate professional’s perspective. It’s about basic points that homeowners should understand, based on my experience in the industry. I like the advice that some of you have said; ask the photographer for some examples of their work and then make your decision. 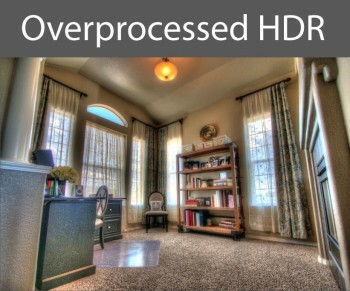 In my experience, most homeowners are going to go for wide angle shots that use HDR imaging. Maybe it’s different in your market, but that’s been my experience thus far. Regarding HDR technique being predominant in your market, sure. I believe that is the case in many markets. The reason for this is not that it is an inherently superior process, but often that it is an expedient process for photographers who either do not have lighting skills or who can’t afford to buy lighting equipment. This is not to say that there aren’t photographers who do very high quality work with HDR and no lighting; however, in my opinion, these photographers are the exception rather than the rule. The fact that, in your experience, the only good real estate photography is done with HDR is hardly an indication that HDR is somehow superior or that supplementary flash lighting cannot be used efficiently and effectively for mainstream real estate photography. Furthermore, it is my opinion that badly done HDR photography tends to look far worse than badly done flash photography, and I think that there is an awful lot of bad HDR photography being done. Nevertheless, I do not mean to say that HDR photography is not useful or should necessarily be avoided. As to a single flash, a skilled photographer with a fairly advanced knowledge of Photoshop could photograph an entire home with one flash (mostly off-camera, although an on-camera flash can give good results in a limited number of situations) and achieve excellent results for real estate marketing purposes. And such a photographer might have never even used HDR, though he or she would very likely have a general idea of what HDR is. Regarding wideangle lenses, I never said that they aren’t the norm for real estate photography or that they shouldn’t be used. I would say that I use wide angle lenses of various focal lengths for approximately 80% to 90% of my real estate marketing photos. What I mean is that a skilled photographer will not slavishly use the widest angle their lens permits for every shot. In some situations, too wide an angle results in excessive scale and volume anamorphosis distortion that creates an unattractive effect, or shows elements that distract from the viewer’s attempt to get a feel for the space. Simply put, the camera does not see the same way that the human eye does, and a skilled photographer understands how to use the medium within its limits, to achieve the most effective image for the client’s needs. As for your comment about frames per second, you provide no basis for your assertion that a faster rate is better for this kind of photography. For action photography, it is an important consideration. However, our subject matter is static. Regarding what homeowners want, homeowners are usually not expert in marketing, photography or the translation of buildings and interiors into two dimensions. It is part of the job of a Realtor to serve as an advisor to the seller in these matters and to collaborate with experts in any areas in which the Realtor is not an expert. Of course some sellers will think they know better than Realtors how to market their home, and you can only try your best under the circumstances. In case you should question what basis I have for such assertions, in a former career I was a mortgage underwriter and assistant real estate appraiser. Also, my family has been in the real estate business for three generations. My father was the sales manager for my grandfather’s merchant home building company and was also for a time President (during a workout period) of a modest home building company called Levitt & Sons (as in Levittowns). So, I have been in and around the residential real estate business most of my life. David, I appreciate your extensive comments and the link to your blog post. It was very informative. I respect your skill level and experience with this subject. I hope to work with a photographer who is as passionate about this subject as you are. In my market, if someone shows up with a flash, it typically means bad photos with lots of shadows. I greatly appreciate your position on the subject and will from here on out acknowledge that the use of flash in real estate photograph can be very affective when done right. I hope to experience that at some point in my area. Thank you for your time and your indepth comments David. Un-believeably bad advice being given in the article. Mr. Andrew is clearly not knowledgeable about photography, and should not be writing about it. I would certainly not try to educate real estate agents about how to sell houses — the author should have the wisdom to avoid topics about which he is not personally familiar. I can only find one thing in the article that I agree with, and that is the importance of a tripod….although a good photographer shooting with flash can excel even hand holding a camera. Why was the concept of looking at a prospective photographer’s portfolio never mentioned? Isn’t this the single best way to ascertain a photographer’s skill? Yet this is not even considered by the author. HDR?? Possibly, but at best this will yield “acceptable” results, and then only if conditions are already pretty good. If you require excellent results, every time, no matter the ambient conditions, then supplemental lighting is going to be required. No Flash?? That is so absurd I don’t know where to start. FPS as a measure of a camera’s performance?? Even common sense says this is a weird assertion. Part of wisdom is knowing when you are not an expert at something. Mr. Andrew would do well to stick to things he knows about. By the way, I did not mean to imply that it is not a good thing to try to please the sellers with the listing photos. The happier the sellers are with the whole process, the more likely they are to recommend their Realtor to others. I disagree on the use of a flash vs. HDR. If you are a pro photographer you know how to use lighting properly, meaning you use bounce techniques, you use multiple slave flashes to overcome shadows an you use reflectors. Using light to your advantage, overcoming backlighting is what separates a realtor taking 500 shots to get 20 good ones or a pro taking maybe 40 shots to get 20. I’ve tried HDR and frankly, it creates a fake looking effect in many cases. During a sale of one of my properties, I had the realtor hire his pro who uses HDR vs. my flash shots and the HDR was incredibly non-realistic. It showed very dark java colored wood as medium colored with high grain which it did not look like in real life. It distorted the wood floors to be a different color. I would say half the photos were much worse, half were comparable, judgement call, none were better. I think the stigma with HDR is that there are many who have used it so poorly in the past. The results can be muddy and flat and sometimes even surrealistic. I battled with it for so long because of color shifts and processing time and now use multiple flashes myself. I have seen some photographers who have done a great job with HDR, but when mishandled oh boy….